The Organization Feeds Rescue Animals Premium Foods or "BETTER" than Premium Foods. Our Animals Live In Private Homes With People Who Love Them! 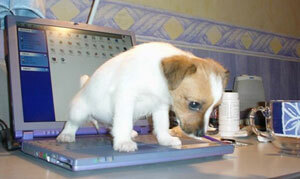 We Pay the Microchip Registration Fee For You! A "Free" Health Exam Coupon Is Yours and Product Discount Coupons! A 30 Minute Pet-Parenting Class Benefits You And Your New Pet! Your adoption placement fees help support veterinary medical for animals that need more than what is customary. Few people donate to local animal rescue organizations leaving most without the ability to help animals in Orange County. When donating keep your dollars here in Orange County. Television showing animals being rescued promote increased calls wanting humane services which cost money that local groups don't have. People unknowingly are giving to the United States SPCA and the U.S. Humane Society and that money is not used here. Beware of mailers telling sad animal stories taking donations that we need desperately for our local spay/neuter funds and animals in crisis. Before you give, find out what organizations are actively doing rescue and donate to local groups. This will help keep local animals provided for. Your adoption dollars support rescue. Be proud that we are able to help local animals with your help. Ear Mites, Colds, Ringworm? Add More $$ For Common Rescue Conditions! RABIES $ 5.00 - $ 12.00 (Rabies vaccines are “Not” Required By Law in Orange County for Cats! * We do not recommend the FIP an intra nasal live virus vaccine in the nose. Just Say NO! • We spend our money on vet medical care, not labor or a facility. Our animals are with people who love and they have been provided with the best possible health care. Sometimes surgeries have been performed to save their life, or make them more adoptable. • Why do animals shelters kill the animals? There is simply not enough money or man-power allocated to change the current system. 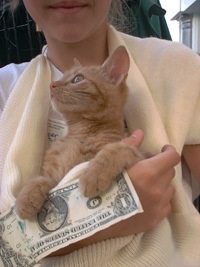 Rescuing animals costs money...we know! • Pregnant animals lose their lives first at most over-crowded municipal shelters, then, unaltered (not spayed and not neutered ) are euthanized next. • We do our best to rescue the pregnant momma cats from death row, raise the babies in loving homes, spay the momma and get her a good new home, too! • The most important thing about our organization is you can talk to the people who raised them or rescued your new pet and feel comfortable knowing their personalities before adopting. • When you adopt from a shelter most new owners must take their new animal to the vet to do the things we have already done for you. Did you know some people did not know that kittens and puppies have worms? And that fleas can cause a cat to get worms? (Age, Size, Breed, or Breed Mix Popularity Determines Fee). Dogs are provided treatment if necessary for curable and common rescue issues such as ear mites, kennel cough, ringworm, mange or eye infections prior to being adopted. All dogs are spayed or neutered, vaccinated, dewormed, have an advantage flea treatment as well as being microchipped with the pet registration fee ($15.00) included, a $ 65.00 value. wand we mail in and pay the $15.00 registration too! Pre-loved Dogs $175.00 - $ 400.00 (Age, Size, Breed, or Breed Mix Popularity Determines Fee). WHY SO MUCH? We often have the popular designer mix breeds that cost upwards of $2,000.00. Why would someone give up a young dog that cost so much? Answer: Many people get these puppies and discover that puppies are too much for them and want to find a good home for them. Since our adoption events are in Newport Beach people needing to give up young pedigree dogs are referred by Russo's Pet Experience in Fashion Island to us. Private Party Dogs are to be spayed or neutered, vaccinated and have proof of Rabies. and an advantage flea treatment as well as being protected with an AVID microchip which includes the pet registration fee ($18.50), a $ 75.00 value. Kittens or rescued adult cats treated for whatever was necessary prior to your adoption and is covered by a 30 day health guarantee. Common treatments covered by the health guarantee are ear mites, colds (URI), ringworm, mange or eye infections. All mother cats are tested for feline leukemia and feline aids and one of each of her kitten litter. Animals are vaccinated, de-wormed, and 30 day advantage flea treatment. A non surgical procedure protects them with microchip identification and we pay the chip registration fee ! The organization feeds rescue animals premium foods. Your adoption comes with a "free" physical exam which is a $50.00 value. You receive substantial discounts on vaccine boosters. Our kittens live in private homes with people that love them. Network kittens are more social & secure because we keep them together and understand the importance of play interaction and social development. Many of our kittens are raised in homes with dogs & active households with children. Some are hand-raised and bottle fed by our caring foster families. Ours Make Great Family Members! Age, Size, Breed, or Breed Mix Popularity Determines Fee. The costs for adoption are as follows and include the microchip and chip registration. Senior Cats Often Have Had Dental Cleaning, X-rays and Extractions If Needed. For Cats Needing New Homes That Are Privately Owned. WHY SO MUCH? Our animals are often better than other adoption facilities as we specialize in 'pet-quality' kittens. Manny kittens are command trained to 'come when they are called' and fed 'above' premium quality food which is a 'grain-free' diet that is better for all dogs and cats. (Size, Breed, or Breed Mix Popularity Determines Fee). WHY SO MUCH? We often have the popular breeds and breed-mix's that look like the popular pure-breeds. Since our adoption events are in Newport Beach many are referred by Russo's Pet Experience in Fashion Island to us.